Albrecht Dürer. 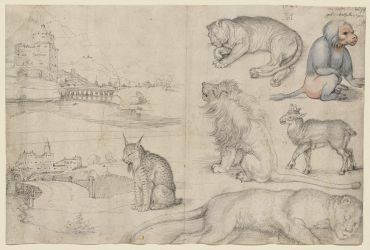 Sketches of Animals and Landscapes, 1521. Pen and black ink, and blue, gray, and rose wash on paper. Sterling and Francine Clark Art Institute, Williamstown, MA. Use the databases and websites below to find a variety of primary-source materials: period documents, books, and periodicals; 19th-century art periodicals with period articles and advertisements, historical newspapers, and articles from 20th century journals across a wide spectrum of subjects and reader interests. On the Clark library’s electronic resources page, click “Additional Resources by Subject” and then the link to “History: Primary Sources” to find more databases and websites that can be used to find primary-source materials from many different sources, countries, and time periods. Full-text database created by the Bibliothèque Nationale de France, which has digitized a wide variety of 17th-, 18th-, and 19th-century books, documents, and periodicals. Click the “Discover” link for “La presse quotidienne dans Gallica” for a list of digitized periodicals that can be browsed and downloaded or printed. Click the “Themes” link to browse/search collections organized by subject, or use the search box to search for specific titles, authors, or subjects. Index to “nearly all” art journals published in the United States between 1840 and 1907. Each issue is indexed completely, including articles, art notes, illustrations, stories, poems, and advertisements. Scanned version of the London Times. Contains full content of the newspaper including advertisements, editorials, reviews, stock exchange tables, and weather reports. Does not include the Sunday edition. Citation index to English and American journal and newspaper articles published in the 19th and early 20th century, including the New York Times, Atlantic Monthly, the Times of London, Harper’s Monthly Magazine, and Harper’s New Monthly Magazine. Also indexes 19th-century monographs, legal periodicals, patents, and some U.S. government publications and presidential papers. Full-text. Indexes the Chicago Tribune, Los Angeles Times, New York Times, Wall Street Journal, and Washington Post. Coverage varies from publication to publication; start dates range from 1851 to 1890. Find advertisements, announcements, reviews, and articles. Citation index to a wide variety of U.S. and Canadian general-interest periodicals and popular, non-technical magazines, a rich source of American cultural history. Find articles and reviews from such publications as Critic, Century, Harper’s, The Nation, and International Studio.